Hi friends! Today’s post was actually born out of one of the daily emails I’ve been sending out to my awesome crew of women taking part in my 28 Day Mind and Body Makeover. We’ve been working on overhauling our diets and changing our relationships with food and our bodies and one of the most important things you can do is actually one of the simplest: Stop Eating When You’re Full! I know it sounds too ridiculously simple to actually make much of a difference, but you’d be surprised how many of us have had it ingrained in our psyches to “clean our plates” or how many of us mindlessly eat in front of the TV without realizing that we were actually full 15 minutes ago. By ignoring the hunger signals our bodies send us we end up constantly overeating, placing a burden on our digestive system, and possibly leading to weight gain in the future. 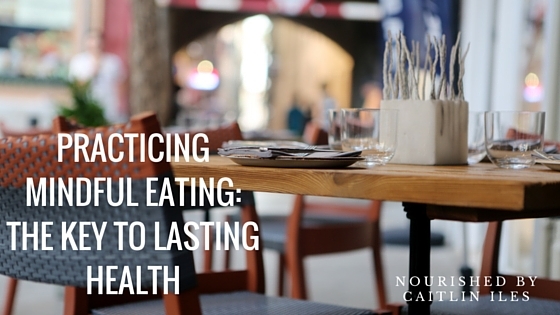 With that being said, today I want to talk about mindful eating. In addition to the mindless eating I mentioned above, in today’s culture it’s not uncommon for our meals to be eaten on the run, in the car, or wolfed down without thinking before heading off to our next meeting, practice, or game. When we eat in these states our bodies are functioning in what is called a sympathetic nervous system state. This state is essentially a stress response in the body where energy and blood flow are shunted away from our digestive system to our muscles and other extremities to help us escape from or fight a predator. It’s commonly known as our fight or flight response and back in the day when we were running from tigers or rival villages it was totally awesome and typically only used in short acute bursts. However, nowadays we are in a constant state of physiological and psychological stress and this acutely affects our digestion. In order to properly breakdown and assimilate the nutrients from the healthy foods we’re eating we need to be in parasympathetic nervous system mode, or rest and digest mode. By slowing down and eating mindfully we allow our bodies the opportunity to switch from SNS to PNS, which not only improves our digestive capacity but can help regulate the production of cortisol, a major hormone player in the dreaded abdominal weight-gain so many of us suffer from. You can check out the great book Cortisol Connection for more information on its role in weight gain and ill health, but for today we’ll just focus on the digestive process and eating mindfully. You can also check out this sweet post for more information on how we can peacefully help our bodies enter PNS mode. Make space to eat, with placemats, cutlery, no TV, no cell phone, no computer. Just you and the food or you, your family, and the food. Listen to the signals your body sends you and if you’re full, even if your plate isn’t empty, stop eating! Save the food in the fridge. You DO NOT have to clean your plate. When you continue eating just to clear your plate it shuts off your body’s inherent hunger signalling, which can lead to overeating, gas, bloating, and indigestion. So eat when you’re hungry and stop when you’re full. Your body will thank you!